Keep your pipes from freezing in the winter. With a built-in thermostat, the Frost King Electric Heat Cable Kit automatically keep your water pipes from freezing, works at temperatures down to 38 degrees below zero. Q: Can I use the Heat Cable Kits on a mobile home feed line? Unfortunately - No. Mobile home lines, like garden hoses, just too flexible and not thick enough to withstand the temperatures of the Heat Cable. Don't do it. Q: Is the light on the Heat Cable supposed to flash on and off? No. The Light should be a solid color. If the light is flickering it could mean the cable is not working correctly and you should not install the cable on your pipes. Q: Do have the printed instructions for the Frost King Automatic Electric Heat Cable Kits? We do... see below... Click here for the full instructions. Q: Can The Heat Cable Kit be placed on a pipe then insulated and covered over with wood or drywall? No, never install the Heating Cable kits in walls, floors, and ceilings. Q: How should I secure the Heat Cable Kit to my pipes? To secure the Heating Cable kit, apply application tape or any good quality electrical tape with a minimum 176 F temperature rating at six-inch intervals. You can secure the Heat Cable Kits with just about any type of tape, but you should stay away from Masking Tape. Masking Tape doesn't have the strength to secure the Cable Kit any length of time, because the adhesive tends to dry out. While it's best to use tape, Cable Ties or Zip Ties will work as long as they are not pulled so tight that they cut into the cable. Q: Can the Heat Cable Kits be used on plastic pipes? Yes. The Heat Cable Kits can be used on plastic water pipes only if they are primary supply pipes with an outside diameter between 3/8" and 1½". The pipes should have, "Schedule 40," printed on the side. Q: Do The Heat Cable Kits come with an automatic thermostat? Yes, all the Heat Cable Kits come complete with a built in automatic thermostat that turns ON the cable when the pipe temperature is below 38 F and turns off the cable at above 45. Q: Can I use the Electic Heat Cable kits on my hot water pipes? Or should I just wrap the cold pipes? Yes. For hot pipes, it is recommended that the heating cables should not be installed on pipes heated above 155 F. You should use the Heat Cable Kit on both your hot and cold water pipes if the pipes are exposed to the cold outside air. 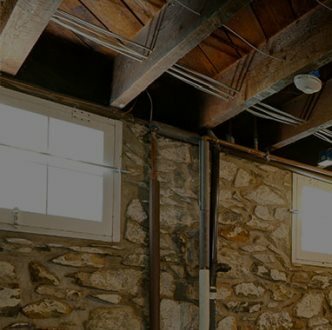 So, if your pipes are under the house, in an exposed crawl space, or against an exterior uninsulated wall; then it might be a good idea to use the Heat Cables on both hot and cold pipes. Remember, the water in the hot water line turns cold unless it is being used constantly. Q: Does light on the plug for the Electric Pipe Heat Cable kit stay on all the time? Yes, it is ON as long as there is power being supplied. Q: Can I use The Electric Heat Cable Kits to protect my water hose? No! The Electric Heat Cable Kits are made for copper, iron or Schedule 40 plastic water pipes only. Don't do it! No, never install the Heat Cable Kits on any type of hoses. Q: How do I know if the Electric Heat Cable Kit is working properly? If the Heat Cable Kit is installed correctly, the light in the plug will be on and the cable should be warm to the touch. You can also test the cable to know if it is working properly. Plug in the cable and wrap a bag of ice around the thermostat block and after 20 minutes, the cable should feel warm to the touch. Q: Can The Heat Cable Kits be used on indoor copper water heating pipes? Yes. The Heat cables can be used on indoor copper water heating pipes. Q: Is it OK to double up the Frost King Heat Cable - on even a small section of pipe? No. Never ever overwrap the heat cable! Over-wrapping may cause the heating cable to overheat. Never use a cable longer than the pipe it is intended to protect. So don't do it. Q: What is the wattage per foot on the Automatic Electric Heat Cable Kit? All of the Automatic Electric Heat Cable Kits (3 feet through 30 feet) carry a rating of 120V, 7 Watts per foot with a maximum draw of 15 Amps. Q: After I apply my pipes with a Heat Cable, can I then put pipe insulation over the cable kit? Rubber Tubular Pipe Insulation can be used over the Heat Cable. But Fiberglass Pipe Wrap with Plastic overwrap or Faced Fiberglass Pipe Wrap is a better choice. The Wrap does a better job completely encapsulating the heat cable to hold in the heat and better protect the pipe. So... Yes, it is recommended that the heating cable is applied on the pipe, covered with ½ inch fiberglass insulation or any equivalent non-combustible insulation with vapor seal. Q: Do you have Frost King Pipe Heat Cable in 100 ft lengths? The longest Water Pipe Heat Cable that Frost King produces is 30 feet long. Keep your pipes from freezing in the winter. With a built-in thermostat, the Frost King Electric Heat Cable Kit automatically keep your water pipes from freezing, works at temperatures down to 38 degrees below zero. Need some more information? Click here for Heat Cable Kit Instructions.